Are you looking for a CAD short course in ? We provide a nationwide in house CAD training service. It may be that you don't need to sit through a fixed topic 3 day course. Typically training courses are split into basic, intermediate and advanced levels and for commercial reasons, instructors aren't allowed to cover higher level topics on a basic course. So it might make sense to look at our in house CAD training where there would be flexibility to answer your questions and practice on your CAD work. Indeed we will cover any topics from CAD or Autocad LT, except for customisation topics for commercial reasons. Or you can take training in your home if you are unemployed for more info click here. Laptops and software are included which can be set up independently in a meeting room so you won't have the inconvenience of rush hour travel to a training venue. 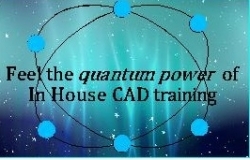 In house training provides the flexibility for training to suit your CAD work. We then provide a summary of topics covered at the end of your course. With page number references back to the included course companion manual. A great point of quick reference after your course. Laminated guides to short cuts and plotting to scale for each person are also included.